NOTE: Text, photographs and graphics by Asitha Jayawardena (http://uk.linkedin.com/in/asithaj) as part of his Sustainable University One-stop Shop Experiment (http://www.sustainableuni.kk5.org/) recognised in UNEP Greening Universities Toolkit (http://www.sustainabilityexchange.ac.uk/files/unep_greening_university_toolkit-final-small_size.pdf page 61). 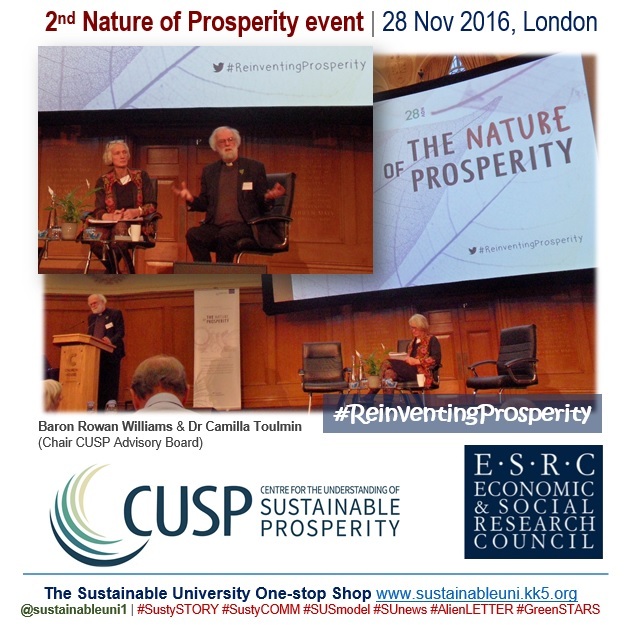 A commitment to moral imagination is vital for sustainable prosperity, said Baron Rowan Williams (former Archbishop of Canterbury) at an event titled Reinventing Prosperity held at Church House, Westminster on 28 November 2016. 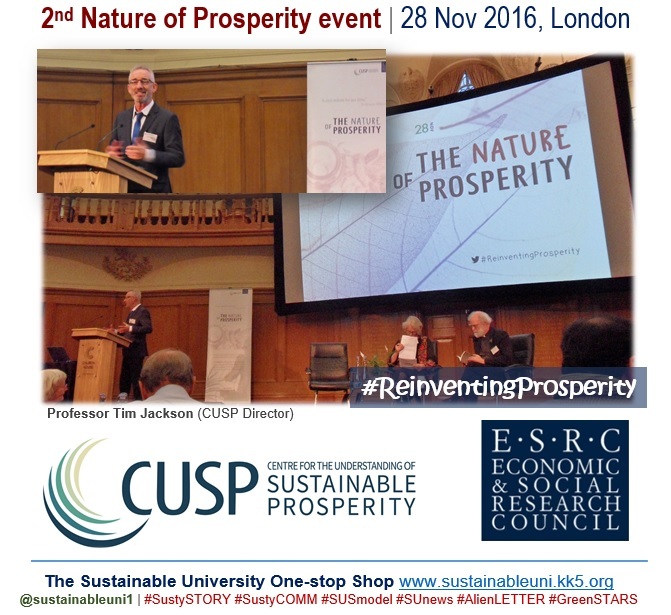 This event is the second of the series of dialogues on the Nature of Prosperity, which is organised by the Centre for the Understanding of Sustainable Prosperity (CUSP), a project funded by the Economic and Social Research Council (ESRC). In his keynote on The Audacity of Hope, Baron Williams (chair of the CUSP dialogues) set out his own vision for a lasting and inclusive prosperity, particularly reflecting on the role of hope in a changing and uncertain world. Co-delivering the second keynote titled ‘Reinventing Prosperity,’ Dr Graeme Maxton (Secretary General of the Club of Rome) emphasised that the free market system driven by growth was part of the problem and not the solution. The other keynote speaker Professor Jørgen Randers (co-author of the 1972 Limits to Growth study) presented the book’s 13 proposals to manage economic growth in order to reduce unemployment, inequality and climate change, and to enhance wellbeing in the long run. Dr Camilla Toulmin (Chair CUSP Advisory Board; Professor in Practice, Lancaster Environment Centre, Lancaster University; and Senior Fellow, Climate Change, International Institute for Environment and Development IIED) facilitated the discussion sessions that followed the keynotes. 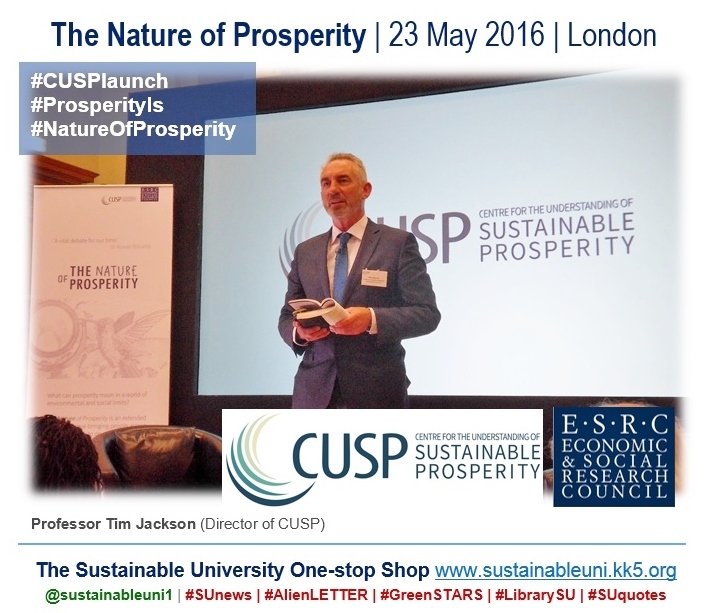 In his welcome and introduction Professor Tim Jackson (CUSP Director and Professor of Sustainable Development, University of Surrey) said that there was no better time than now for engaging in the task of exploring the nature of prosperity. Baron Rowan Williams (former Archbishop of Canterbury and chair of the CUSP dialogues) delivered the first keynote, The Audacity of Hope. Hope and optimism are different. Optimism tells us to ignore world’s problems. Hope gives us strength to face today’s problems and encourages us to look through and beyond them. Hope refuses to ignore what the world is but insists on prosperous alternatives. What is prosperity? Prosperity is not just feeling comfortable but a sense of tomorrow that is neither empty nor threatening. We don’t know the future, but we can know the possibilities that future might bring. Instead of optimism, what we need is the audacity of hope in order to see simultaneously the possibility of the worst and the possibility of prosperous alternatives. So hope is central to prosperity. We need to learn to inhabit our world with boundless curiosity and fearless honesty. Inhabiting the world with a clear sense of what we are up against is where we have the audacity of hope. Imagination has a key role in prosperity. If we close down our imagination in the times of crisis, we cannot expect to be well or prosperous. We should imagine a future of adaptable, just and eco-environment, which is limited but life-giving. Mere imagination is not enough. What we need is moral imagination – imagining the future of others, not just our own future. We need to cultivate the habit of thinking about others’ future as part of our own wellbeing. Here, we need to turn to the institutions of imagination in society. We need these social and cultural institutions of imagination – particularly education. However, ethical imagination (‘what is like for others?’) is sadly lost from current education at some point after primary. For instance, the popular MCQ (multiple choice questions) approach to testing restrains our imaginative response. Sustainable prosperity depends on a commitment to moral imagination. So, for sustainable prosperity, we need a model that accommodates the thinking of the others’ future as well as our own. We also need to engage with institutions of imagination in order to learn how to embrace and inhabit our limited and life-giving world. What we need is not world governance but habits of cooperation. Sustainable Prosperity is therefore a large cultural question, which is not reducible to conventional academic disciplines. Sustainable Prosperity requires a reworking of our culture – through systemic change, not by tinkering. An exhibition titled ‘A dream of a low carbon future’ took place during the refreshments. It was based on an inspiring graphic novel by James McKay and Benjamin Dickson. 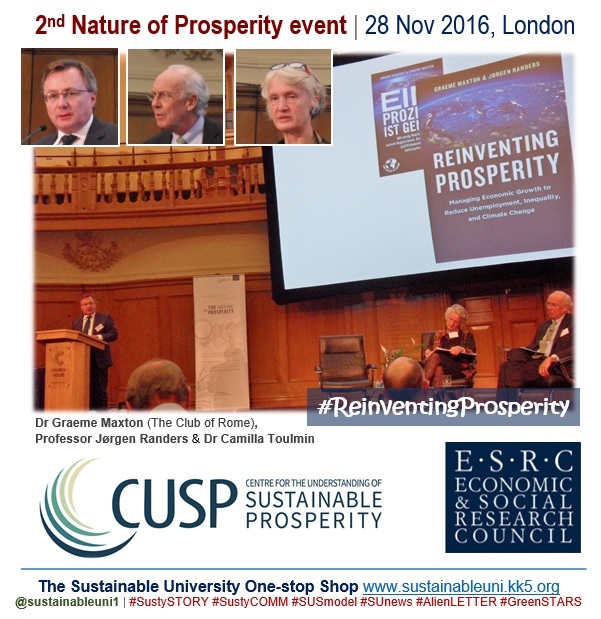 Dr Graeme Maxton (Secretary General of the Club of Rome) and Professor Jørgen Randers (co-author of the 1972 Limits to Growth study), co-authors of the book Reinventing Prosperity, delivered the second keynote. There are limits to growth and excessive growth brings about environmental and social consequences. Environmental consequences include climate change; species loss; pollution of air, waterways, soils and oceans; and anthropogenic destruction. Among social consequences are: greater conflict due to inequality, drought, resources and climate change; widening gap between the rich and the poor everywhere; and high unemployment in much of the world. We believe that growth brings jobs but despite growth in the developed world, unemployment has risen. We believe that growth reduces inequality but despite growth inequality has risen within countries and particularly between countries over the period 1820-2000. We believe that growth reduces poverty but with accounting for inflation, the percentage of the global population living on $2.65 a day was 53% in 2010. Despite all these, we don’t take action because of a variety of reasons, such as politics, vested interests, short termism and natural inertia, timing and cost. We do not need new technology or innovation; we already have enough of them. The free market cannot solve the problem; rather is the cause of the problems. Scaling up grassroots initiatives is not enough. And we do not need instant answers, which are non-existent anyway. What we need is implementation of change over a period of 20 years or more, particularly moving 1% of GDP every year from dirty to clean energy production. We need a TRANSITION like that. Professor Jørgen Randers focused on their book’s 13 proposals to manage economic growth in order to reduce unemployment, inequality and climate change, and to enhance wellbeing in the long run. These measures will reduce the population size, number of hours worked a year and insecurity, contributing to sustainable wellbeing. The Nature of Prosperity series of public dialogues, hosted by CUSP, engages young and old alike across business, policy and civil society in perhaps the biggest question of our time: What does prosperity mean in a world of environmental and social limits? The inaugural event was held in London on 23 May 2016. It featured Baron Rowan Williams, long-time peace and environmental activist Satish Kumar, Professor Jane Elliott (Chief Executive of the ESRC), Karen Hamilton (Global Vice President Sustainable Business, Unilever), Professor Tim Jackson (Director of CUSP) and Caroline Lucas (MP and Chair of the All Party Parliamentary Group on Limits to Growth). Note: This news post is based on my notes at the event, some slides of the keynote speakers and some tweets with the hashtag #ReinventingProsperity. 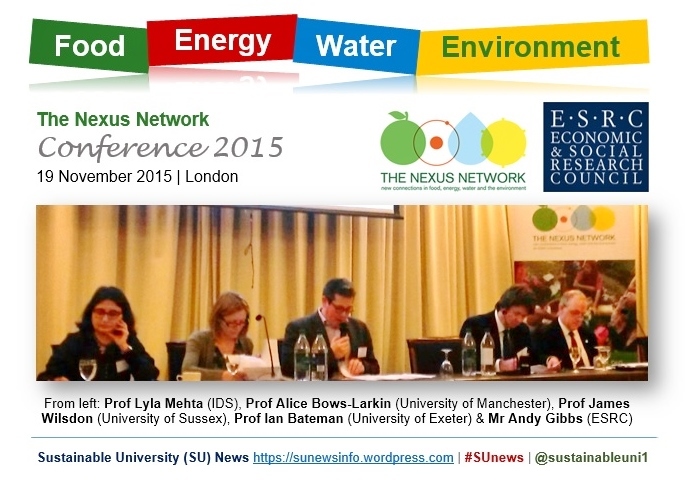 The Nexus Network’s second annual conference, titled ‘Scales, Levels and Spaces of the Nexus’, was held on 19 November 2015 in London. 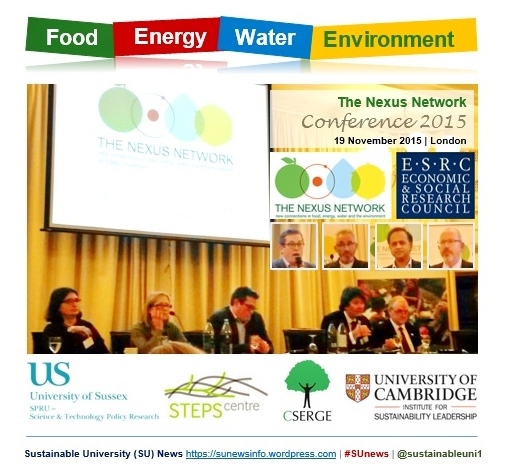 The Nexus Network fosters debate, innovative research and practical collaborations across the linked ‘nexus’ domains of food, energy, water and the environment, bringing together researchers, policy makers, business leaders and civil society to develop collaborative projects and improve decision making in these areas. This network, funded by the Economic and Social Research Council (ESRC), is a collaboration between the University of Sussex, the University of East Anglia (UEA) and the Cambridge Institute for Sustainability Leadership (CISL). In Plenary 1 on Introduction, Chair Professor James Wilsdon (Director, The Nexus Network/ University of Sussex) emphasised the need for cross cutting research that transcends traditional disciplinary research and also announced the Partnership Grants call worth £300,000 (deadline 31 January 2016). His introduction was followed by brief talks by the four panel members, stimulating the participants into thinking about various aspects of the nexus. Professor Alice Bows-Larkin (EPSRC-funded Stepping Up project/ University of Manchester) talked about her work on the Stepping Up project, which aims to understand what makes innovations have low-impact at the Water-Energy-Food nexus and then, based on this understanding, amplifying and multiplying good practice. Andy Gibbs (Head of Economic Performance and Environment, ESRC) spoke about the development of the Nexus Network from a concept to a funded activity. He highlighted the importance of interdisciplinary research as the way forward for nexus research. He said that, in nexus research, one should be innovative and entrepreneurial and should look for opportunities not for disciplinary badges. Professor Ian Bateman (Nexus Network Co-Investigator from the University of Exeter) highlighted that, because food, water and energy draw upon the natural capital base, trade-offs would be unavoidable. He observed that, today, big research contributions in response to global challenges cannot not discipline-bounded. He also talked about links between nexus researchers and policy makers. Professor Lyla Mehta (Nexus Network Co-Investigator from the Institute of Development Studies) talked on the politics of working on the nexus at different scales, especially in the global South. She revealed that, although knowledge silos are prevalent at global, regional and national levels, at a village level, people have always known that food, water and energy are interconnected. 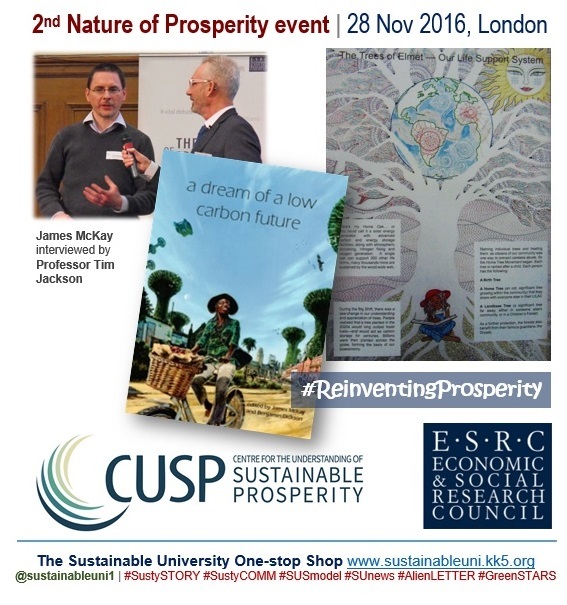 Professor Tim Jackson (Lead of the ESRC Centre for Understanding Sustainable Prosperity/ University of Surrey) delivered his keynote titled ‘Flourishing within Limits – towards a social science for sustainable prosperity’. He asked a couple of thought-provoking questions: Are there any limits to growth? Does nature impose limits to growth? Or has human innovation got the capacity to overcome such limits? He observed that, although modern society’s heroic vision proclaims that there are no limits to growth, the food-water-energy-environment nexus indicates some kind of limit to growth. There is a deficit in our understanding of the concept of limits, he said. Can we do better, live better and have more fun with less stuff? he asked, highlighting that, although the basic need for subsistence is met through materials, prosperity transcends material concerns. He emphasised the need for redefining the direction of development and the essence of human prosperity and framed sustainable prosperity as an art of living well – within the limits of a finite planet. Slow living, he said, is a way forward for sustainable prosperity. 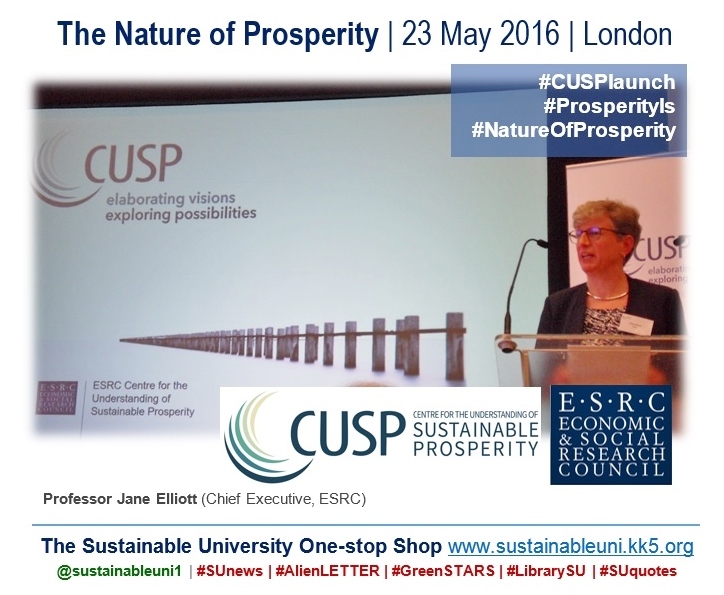 He also talked about the ESRC-funded Centre for the Understanding of Sustainable Prosperity (CUSP). Its guiding vision for sustainable prosperity is one in which people everywhere have the capability to flourish as human beings – within the ecological and resource constraints of a finite planet and its aim is to explore the dimensions of sustainable prosperity and to develop clear, pragmatic steps that could be taken in pursuit of it. For knowledge sessions, the conference split into five parallel sessions, structured as interactive thematic discussions. Nexus Interactions at the household level. The session explored the interdependencies of the nexus at the household level. The speakers from the Domestic Nexus team emphasised the importance of understanding the dynamics of household practices and their relations to provision of water, energy and food to an holistic understanding of the nexus. Nexus shocks: informing decision making in response to shocks. Candice Howarth (Anglia Ruskin University) and Geoff Darch (Atkins) | Chair: Ian Bateman. In this session the Nexus Shocks Network focused on Nexus Shocks – i.e. low probability, high impact events that span energy, water and food systems. They affect multiple stakeholders, scales and disciplines, making them complex to understand and uncertain to address. The session outlined findings from five workshops held earlier in 2015 to explore strategies for effective decision-making on Nexus Shocks. Levels of decision-making and their mismatches. David Demeritt (King’s College London) and Frieda Metternich (Green Alliance) | Chair: Ruth Welters. This session explored the following question: How do policy decisions on nexus issues currently work, and how can the capacity for policy deliberation, at different levels, on complex environmental and social interdependencies of the nexus be improved? International development, innovation and scale. Euan Phimister (University of Aberdeen) and Peter Cruddas (Cranfield University) | Chair: Gemma Cranston. The session asked what the synergies are between the Nexus agenda in developed and developing contexts and more broadly how developed and developing countries can work together through the nexus to achieve the Sustainable Development Goals (SDGs). Nexus struggles: agricultural scales, policy spaces and nexus interactions. Steffen Böhm and Zareen Bharucha (University of Essex), Tom Wakeford (Coventry University) and Antonio Ioris (University of Edinburgh) | Chair: Cian O’Donovan. The speakers pointed to the limits, insufficiencies and shortcomings of the current dominant understanding of the nexus as a hegemonic concern for security, resources and technologies. Instead, they problematized the nexus as a historical struggle between corporate, state and social movement actors, illustrating this concept by engaging with the struggles in the global and UK food system. For the workshop sessions as well, the conference split into five parallel sessions, offering facilitated spaces to discuss current issues and opportunities. Focal scales, knowing spaces and methods of the nexus. This session explored how the choice of focal scale at which nexus interactions are examined affects choices of methodology and examined the implications of these choices. It continued discussions started at a previous Nexus workshop on transdisciplinary methods. The funding landscape for nexus research. Facilitators: Hannah Collins and James Wilsdon. In this uncertain period for research funding, cross-disciplinary, challenge-focused research such as Nexus research is likely to increase in significance and emphasis. This session scanned the funding horizons and explored some shifts that might occur over the next five years. Policy engagement on the nexus. This session jointly examined the challenges to effective academia-policy engagement while extending the discussion beyond impact to knowledge exchange and knowledge co-creation. It asked if focussing on nexus areas could improve the responsibilities for attending to the long-term while remaining agile in responding to immediate events. The politics of ‘scaling up’ (technologies, discourses, policies, etc). Among the issues this session addressed is that a global focus on nexus security risk obscures local political inequalities or complexities. The session also explored the politics of considering nexus questions at different scales. This session will contribute to the agenda of the forthcoming Nexus workshop on resource conflicts. Building a research career in interdisciplinarity. This session explored the challenges of inter- and transdisciplinary work faced by early career researchers and policy experts working specifically on nexus-related areas. It discussed how these might be overcome through training, support and other mechanisms. 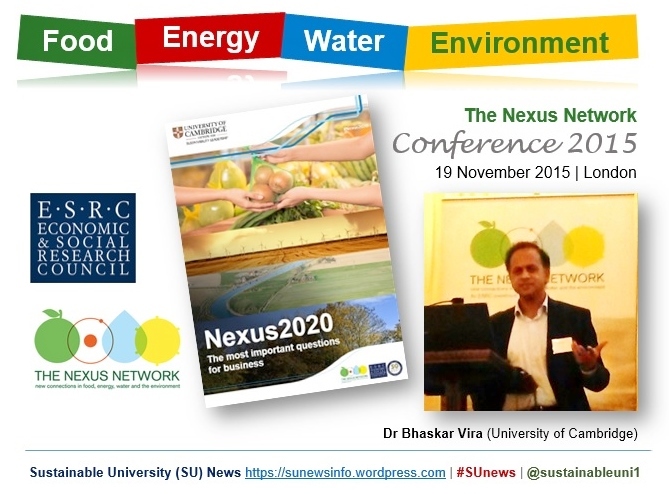 Dr Vira on Nexus2020 | What are the key questions for research to improve business management of the nexus? In Plenary 2 Dr Bhaskar Vira (CISL/ Cambridge University) introduced the results of the Nexus2020 project. Focusing on the idea that businesses should prepare to address nexus issues without undermining other users and corporate goals, this projects asks the question: Can this be better achieved by bringing in the research community? Framing Nexus2020 as a two-way dialogue between research and business, he stated that the aim of this project is to determine the top questions for business around the food-energy-water-environment nexus with a view of making business practice more sustainable. He outlined the work so far to find these top questions that research should answer in order to improve business management of the nexus. In response to an open call for questions from March to July 2015, over 230 participants from business, policy, academia and civil society submitted in excess of 700 questions. Then, at a two-day workshop at Cambridge University, a select group of senior business practitioners and researchers identified the top 40 questions, which are to be revealed in a forthcoming journal article. He hoped that, in the future, multi-disciplinary panels of researchers and business practitioners will devise projects to deliver the solutions to these pressing nexus issues. He described how nexus issues are not just an abstract academic concept, but are at the heart of the current conflicts across the world. Observing that thinking about food itself is a nexus problem, he outlined the huge impact of the agri-food sector on climate change. Food is crucial in confronting global challenges, he said, emphasising that changing diet is more important than changing car use when it comes to climate change mitigation. He also reminded that, when we import food, we are importing embedded water and energy as well. He proposed that, when it comes to food, instead of always focusing on increasing the supply, we should also focus on addressing the demand issues in order to ensure a sustainable supply as well as health and wellbeing. Intervention in demand side will be difficult but not impossible, he said. He also emphasised the need for systems thinking and continued collaboration between initiatives. The event came to a close with closing remarks by Professor Wilsdon. An informal networking session driven by a drinks reception followed. Note: Photographs by Asitha Jayawardena; logos in the graphics are from respective websites; other graphics are from the title pages of the keynote speakers’ presentations and the Nexus2020 brochure. 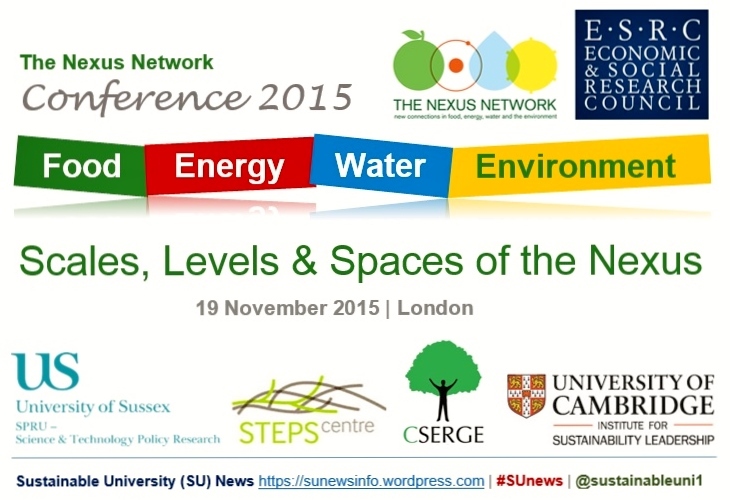 The 2015 Nexus Network annual conference, titled ‘Scales, Levels and Spaces of the Nexus’, will take place in London (Mary Sumner House, 24 Tufton Street, Westminster SW1P 3RB) on 19 November 2015 (10am–5.30pm). Funded by the Economic and Social Research Council (ESRC), the Nexus Network is a collaboration between the University of Sussex, the University of East Anglia (UEA) and the Cambridge Institute for Sustainability Leadership (CISL). In the past five years, the idea of the ‘nexus’ has developed a surge of interest as a way of thinking about the interdependencies, tensions and trade-offs between food, water and energy security, in the wider context of environmental change. Because these different systems are inextricably linked, efforts to improve sustainability in one domain without considering wider connections often prove inadequate. This necessitates more integrated approaches that move beyond sectoral, policy and disciplinary silos. 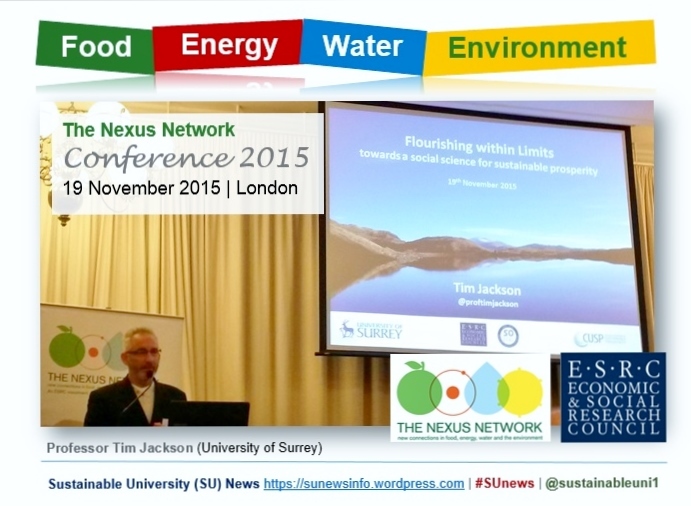 Structured around a number of keynote talks and interactive discussions, the 2015 Nexus Network conference will bring together researchers, policymakers, businesses and others interested in the sustainability of food, energy, water and the environment, providing them with an opportunity to identify and strengthen connections between different projects and initiatives in this area. The event will feature two keynote speakers: Professor Tim Jackson (lead of the ESRC-funded Centre for the Understanding of Sustainable Prosperity CUSP) and Professor Tim Benton (Champion for the UK Global Food Security programme). 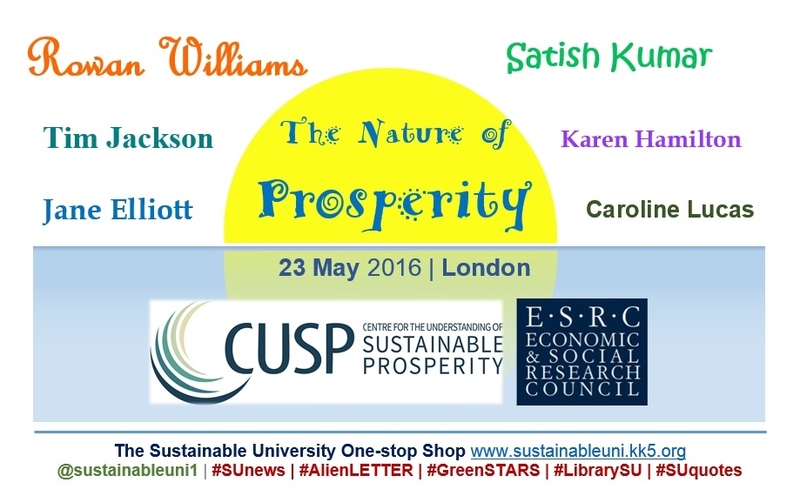 10.50 Keynote: Flourishing within Limits – towards a social science for sustainable prosperity. • A1. Nexus Interactions at the household level. • A2. Nexus shocks: informing decision making in response to shocks. • A3. Levels of decision-making and their mismatches. • A4. International development and innovation. • A5. Nexus struggles: agricultural scales, policy spaces and nexus interactions. • B1. Focal scales, knowing spaces and methods of the nexus. • B2. The funding landscape for nexus research. • B3. Policy engagement on the nexus. • B4. Nexus politics at different focal scales (technologies, discourses, policies). • B5. Building a career in interdisciplinarity. 15.00 Plenary 2. Nexus2020 – selecting the most important questions for business. 16.15 Plenary 3. Systems approaches to managing the nexus: can we really do it? 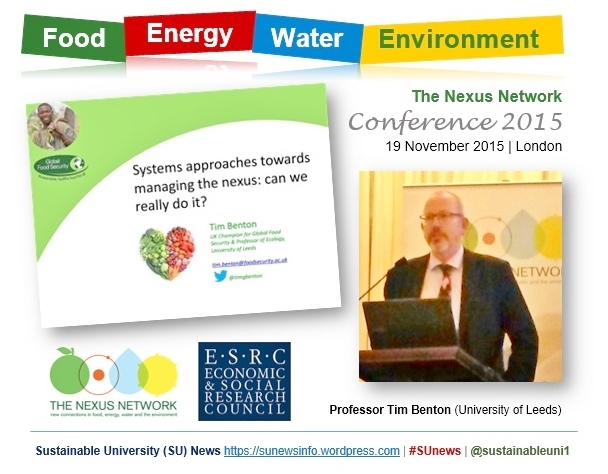 The Nexus Network is an ESRC funded, three-year initiative to foster debate, innovative research and practical collaborations across the linked ‘nexus’ domains of food, energy, water and the environment. It brings together researchers, policy makers, business leaders and civil society to develop collaborative projects and improve decision making in these areas. • Encourage debate, fund innovative research and improve decision making across the linked ‘nexus challenges’. • Enable researchers and stakeholders to develop and share new methodologies, data, conceptual frameworks, skills and practices directed towards nexus challenges. To achieve these aims, the network funds research; provides opportunities for dialogue and debate; develops a suite of methods, tools and briefing papers; and acts as a UK hub for nexus-related news and discussion. Science and Technology Policy Research Unit (SPRU) at the University of Sussex is an interdisciplinary research centre in science and technology policy and management. Its research addresses pressing global policy agendas, including inclusive economic growth, energy policy and pathways to a more sustainable future. 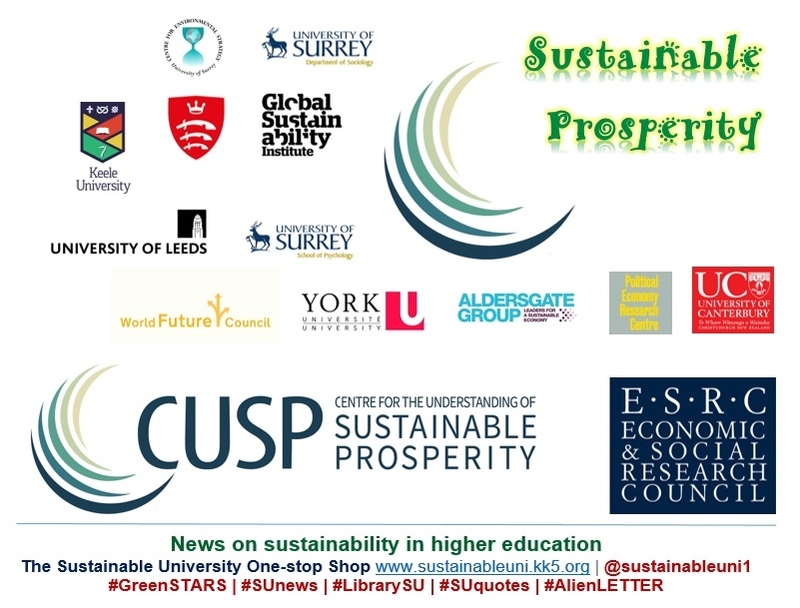 Social, Technological and Environmental Pathways to Sustainability (STEPS) Centre, based at the Institute of Development Studies and SPRU, is an interdisciplinary global research and policy engagement centre uniting development studies with science and technology studies. Its cross-cutting work covers agriculture & food; energy & climate change; health & disease and water & sanitation. Centre for Social and Economic Research on the Global Environment (CSERGE), based at the University of East Anglia (UEA), is a leading interdisciplinary research centre in the field of sustainable development and decision making. It consists of a number of collaborating disciplines including economics, political science, social and group sciences and the natural sciences. Cambridge Institute for Sustainability Leadership (CISL) is an institution within the University of Cambridge with a mission to empower individuals and organisations to take leadership to tackle critical global challenges. Bringing together business, government and academia, it challenges, informs and supports leaders from business and policy to deliver change towards sustainability. In the UK, the ESRC is spearheading efforts to support interdisciplinary research and cross-sector collaborations designed to tackle nexus challenges. Further investments are planned over the next three years in order to realise its vision for the Nexus Network, i.e. building a community of researchers and stakeholders that is better placed to tackle nexus interdependencies, trade-offs and decision-making processes. 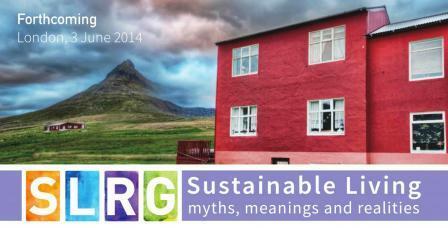 The Sustainable Lifestyles Research Group (SLRG) will host a workshop on ‘Sustainable Living: myths, meanings and realities’ in London on 3 June 2014. Building on over a decade of research, the event aims to synthesise the lessons from the group’s work on developing new understandings of the processes which lead to changes in people’s lifestyles, behaviours and practices. It also intends to offer evidence-based advice to policy-makers hoping to build and nurture more sustainable ways of living. Featuring plenary presentations from the SLRG team and panel discussions with invited experts, the day will offer participants the opportunity of gaining an in-depth understanding of key findings of SLRG research and a lively debate about the challenges ahead. 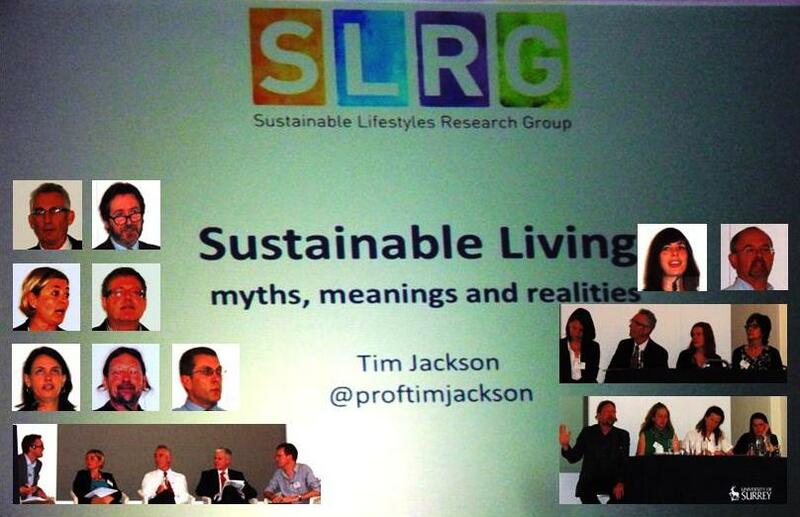 The SLRG aims to develop understandings of the processes which lead to changes in people’s lifestyles, behaviours and practices and also to offer evidence-based advice to policy-makers about realistic strategies to encourage more sustainable lifestyles. Moreover, it strives for building capacity for research in sustainable lifestyles amongst academics, young researchers, practitioners, and user communities. The group receives core funding from the Department for the Environment, Food and Rural Affairs (DEFRA), the Economic and Social Research Council (ESRC) and the Scottish Government and additional funding for individual projects from the European Commission and the ESRC.